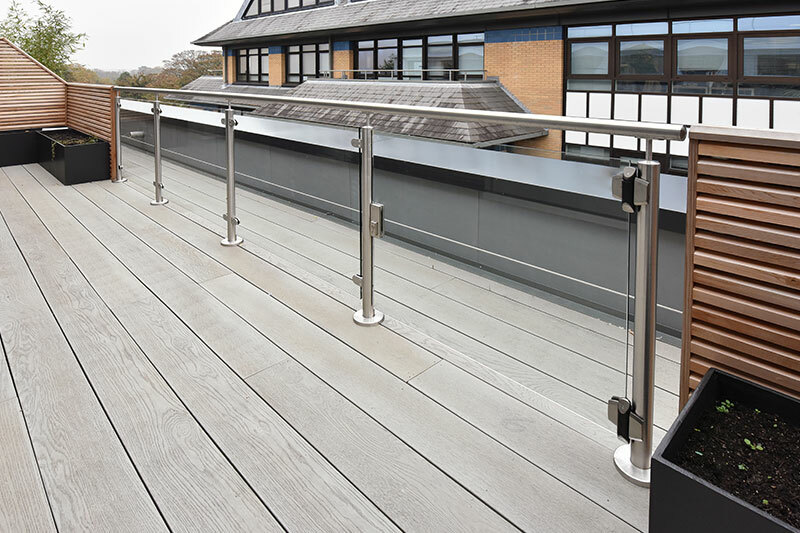 Glasstec Systems is proud to have designed and installed a range of sleek glass balustrades and railings systems at Linden House, set in the heart of Horsham. Formally a commercial property Linden House has been loving converted into an impressive residential building that’s home to 63 high end luxury apartments. 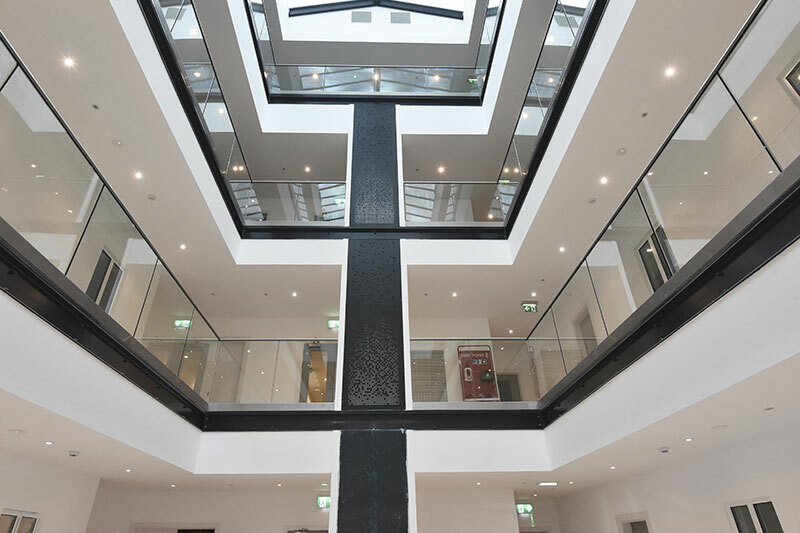 Glasstec Systems were chosen to design and install approximately 70 linear metres of frameless glass balustrading and approximately 30 linear metres of posted glass railing systems across three floors and apartment balconies. 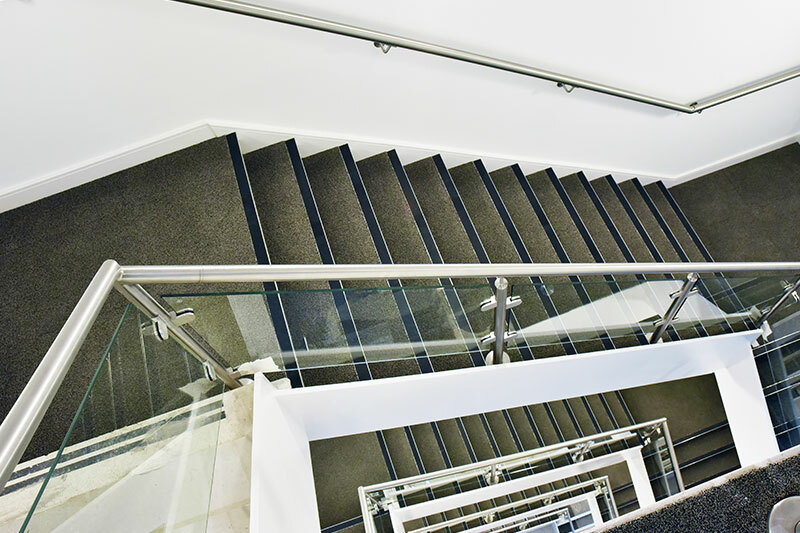 Minimal frameless glass balustrade systems using 19mm clear toughened glass featured on the 1st, 2nd and 3rd floor levels to provide safe barrier protection and maintain the light, elegant feel of the impressive full height atrium area at the core of the building. 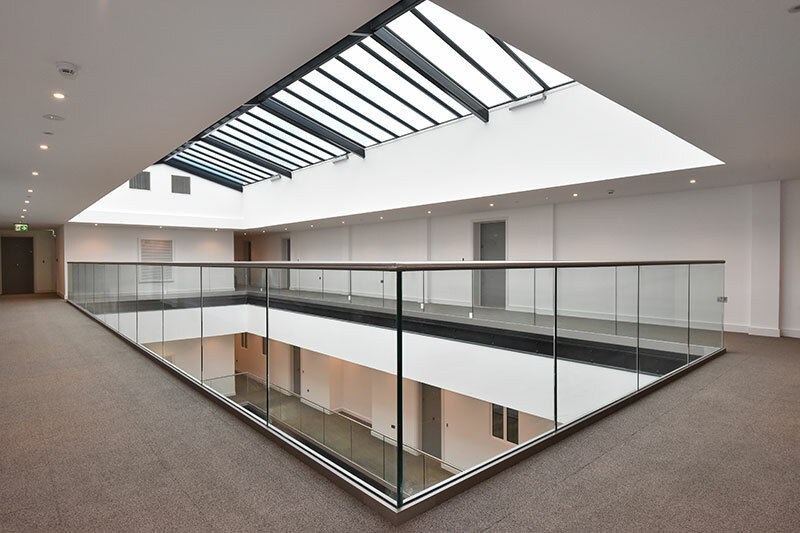 The central atrium with glass ceiling and striking frameless glass balustrading provides a fitting centre piece for the converted building, creating a relaxed central meeting point for the residents. This unique development of high specification apartments also features high quality post railing systems by Glasstec Systems. 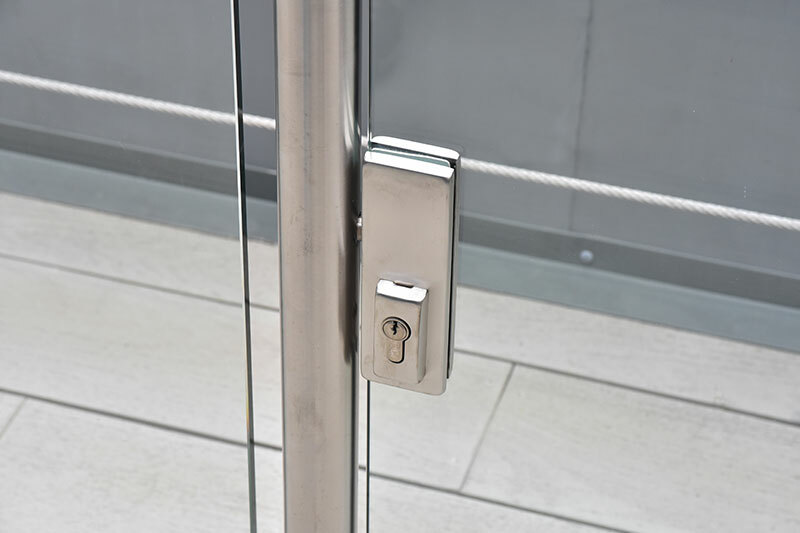 Within a selection of the private apartments are beautiful balcony terraces secured by 10mm thick toughened glass infills and posts with subtle incorporated access gate with lock fittings. The team has decades of industry experience, over fifty years! They specialise in providing ‘hands on’ structural glass solutions, from the initial enquiry all the way through to sign off on site. At its heart Glasstec Systems is a business that still holds true to the values and work ethic of its family run beginnings. Today Glasstec Systems is known for its fully committed approach to a project, the team are happy to work at the initial design stage to advise and inform on possible structural glazing solutions – and those that might not be possible! Glasstec Systems are often asked by Architects for advice on glazing solutions. “We like this design/structure but how do we do it in glass?” is a common question they are happy to answer. The quality of Glasstec Systems work is testament to their detailed involvement and teamwork ethos. Glasstec Systems have undertaken a range of projects this year involving meticulous attention to detail and lots of hard work. The Smiths Building, Great Portland Street is a fine example of this, a project that involved structural glazing and detailed metalworking to be combined to produce a stunning shopfront installation and a happy client. Experts in commercial and residential structural architectural glazing, Glasstec Systems is a well-established business supplying bespoke glass solutions throughout North London, Essex and surrounding areas including large projects further afield. We are able to realise Architects’ and contractors’ designs and convert them into glass. Family values are core to the operation, where the team is committed to providing the highest quality bespoke architectural glass products, including glass partitioning, structural glazing, glass balustrades, frameless glass showers, juliet balconies, shop fronts, glass canopies, coloured glass, glass roofs and more.